(Interfax) At its concluding session on Friday, the Bishops’ Council of the Russian Orthodox church resolved to divest Bishop of Anadyr and Chukotka Diomid of his order. By an absolute majority (with only three abstentions) participants in the council voted for his “discharge from the cloth” for insubordination to the hierarchy, a correspondent for the portal “Interfax-Religion” reported. “The council calls him to immediate repentance and cessation of activity. In the event of his refusal, the council’s decision takes effect,” one of the participants of the forum told the news agency. The period in which the bishop must repent also was defined: until the next session of the Holy Synod. Along with this action the Bishops’ Council unfrocked a former confederate of Bishop Diomid, Hegumen Ilia Empulev, the author of a recent open letter from a group of clergymen who refuse to commemorate the name of Patriarch Alexis II during the liturgy. Three other signatories of this letter, Archprist Vladimir Mordvov, Priest Ioann Balitsky, Monastic Priest Antony, were inhibited from ministry by the council until they repent. 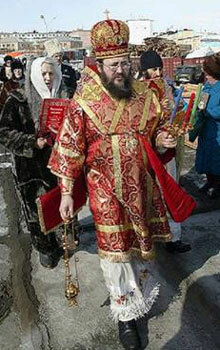 Over the course of a year and a half Master Diomid has frequently issued various kinds of appeals in which he called for the self-isolation of the Russian Orthodox church and for its renunciation of its dialogue with authorities and representatives of other religions and confessions, a well as for renunciation of active evangelistic activity among youth. . . . The Sacred Bishops’ Council, moved by concern for the faithful flock of the Russian Orthodox church and concern for the witness to the world of Jesus Christ, has carefully reviewed the activity of the Right Reverend Bishop of Anadyr and Chukotka Diomid. Beginning in January 2007, in the name of the Right Reverend Diomid public appeals began to be circulated, which disrupted the peace of the church and upset believers, causing a stumbling block for them, and which also evoked misunderstanding among nonchurch people. The Right Reverend Bishop Diomid was absent from the Bishops’ Council without valid reason. His appeal to illness was not confirmed by official medical conclusion. At the same time, the public actions of His Eminence on the eve of the council, including a diocesan assembly conducted by him, give evidence of his physical capacity to come to Moscow. Without having the possibility of hearing its brother personally, the council nevertheless concluded it necessary to express its condemnation in connection with his activity. The council acquainted itself with the written appeals of Bishop Diomid as well as with the testimony of church representatives who engaged in dialogue with him. Special attention was given to the theological and canonical analysis presented by the synodal theological commission and the letter from the Ecclesiastical Council of the St. Sergius Holy Trinity lavra, the hortatory letter of the Right Reverend Bishop of Sergiev Posad Feognost, references from teachers of the Moscow Ecclesiastical Academy, and evaluations of many other members of the church. On the basis of the investigation of all documents, testimony, and circumstances, the Sacred Council finds the most grievous guilt of the Right Reverend Bishop Diomid in this, that by his appeals and declarations he has cultivated a spirit of schism in the church, disrupting its unity that the Lord Himself commanded (Jn. 17.21). It is especially painful for us to witness this after the restoration of unity within the local Russian Orthodox church on 17 May 2007. It was at this time that the enemy of humankind, dismayed by the newly restored fraternal fellowship, inspired a spirit of division. The separate claims and expressions found in the appeals of Bishop Diomid have led to a confrontation of the church with the state and society. Several statements advance a claim to the exclusive correctness of the views of the author with regard to those questions on which the church always has permitted disagreement, in particular, on questions dealing with the political structure of society. As a result, an attempt has been made to identify Holy Orthodoxy with a certain political option. Expressing his opinions on critical problems of church life, which in themselves deserve discussion, Bishop Diomid has acted not in a spirit of brotherly love but in the form of crude denunciations of his brethren. Threatening schism in the church, the author of the appeals demands that his point of view be adopted and he has not manifested concern for a conciliar determination of the truth, based on sacred scripture and the sacred tradition of the holy church. Addressing his appeals to the whole plenitude of the church, the Right Reverend Diomid exceeded the canonical rights of a diocesan bishop and encroached upon the authority which in the Russian Orthodox church belongs to the Bishops’ Council, the Holy Synod, and His Holiness the patriarch. In acting this way, Bishop Diomid violated rule 34 of the Holy Apostles and the existing bylaws of the Russian Orthodox church (X.15). The council found in the appeals of the Right Reverend Diomid many examples of slander, disinformation, and outright lies with respect to the actions of the primate of the church and individual archpastors. The maintenance of the purity of Holy Orthodoxy cannot be accomplished by means of the above mentioned actions. Because, as the Lord Jesus Christ says, “by their fruit you will know them. Can one gather grapes from thorn bushes or figs from thistles?” (Mt. 7.16). Questions that disturb the conscience must be posed in accordance with established procedure at a Bishops’ Council or before the Holy Synod and patriarch. A bishop who enters into discussion with his brethren must observe meekness, respect, and fraternal love, without trying to predetermine beforehand the decisions of the plenitude of the church on one or another question. Bishop Diomid bears the full responsibility for the stumbling of some members of the church which has brought them into confrontation with the hierarcy and the present Sacred Bishops’ Council, and he is seen to be guilty of schism and the disorderliness and destruction of pastoral activity in the diocese entrusted to him. We pray for the reconciliation of souls and the creation of likemindedness in the Anadyr-Chukotka diocese and we call for universal prayer for the preservation of the unity of our mother church. At the same time, conscious of our responsibility before God, the council considers it necessary to act firmly, in order to prevent the spread of a schismatic spirit. 1. To condemn decisively the activity of the Right Reverend Bishop of Anadyr and Chukotka Diomid, that contains violation of canonical norms (Apostolic Rule 34, rule 6 of the second ecumenical council, rules 13, 14, and 15 of the Quinisext council, rule 9 of the Antioch council) and injecting a stumbling block into church life. 2. To eject Bishop Diomid from holy orders for commission of canonical crimes, expressed in slander and lies directed against the hierarchy and for inciting schismatic attitudes and actions. 3. Wishing to facilitate the correction and spiritual healing of a brother, the council calls Bishop Diomid to immediate cessation of the activity that deceives the flock of the church and promotes schism, and to repentance for what he has done before the whole church plenitude represented in the Holy Synod by its next session. 4. In the event of Bishop Diomid’s repentance, the Holy Synod will make a judgment about his further ministry. 5. The decision of the Sacred Bishops’ Council regarding Bishop Diomid’s dismissal from his orders [lit. “discharge from the cloth”–tr.] will take effect in the event of his refusal to fulfill the demand contained in point 3 of the present determination. 6. For having gone into schism, Hegumen Ilia is unfrocked and Archpriest Vladimir Mordvov, Priest Ioann Balitsky, and Monastic Priest Antony are inhibited from ministry until their repentance. (tr. by PDS, posted 27 June 2008). (RIA-Novosti) – The Russian Orthodox Church degraded from priesthood on Friday Bishop Diomid of Anadyr and Chukotka for criticizing the hierarchy and provoking a schism. The Church’s eparchial council also banned some clerics in the Far Eastern diocese from holding services. “We have long tolerated every accusation and attack. His statements tempted people,” Patriarch Alexy II of Moscow and All Russia said. In his letters, published in the Novye Izvestia newspaper, Diomid described the evolving ecumenism as “heretical teachings.” He also criticized the Russian Orthodox Church for “implicitly approving instead of denouncing the incumbent government’s anti-national policies” and called the church’s consent to democracy a mistake. The same publication slammed the Group of Eight major industrialized nations as a body of global Masonry, designed to pave the way for the arrival of a single global leader, or antichrist, and warned against any spiritual cooperation with the “dangerous” group. The resolution said Diomid’s calls for rejecting communication with other denominations and religions were a manifestation of sectarian ideology and schism.